Baking and decorating a charming bunny cake is such a sweet way to highlight a birthday party, celebration or other special occasion. If you happen to have one of those cast-aluminum bunny pans that were sold through the Martha by Mail catalog, then it's as easy as whipping up some cake batter and baking it in the oven. Swiss meringue buttercream can then be piped with a star tip to define the shape of this adorable bunny. I think this cake is perfect for Easter! The tradition of molded cakes derives from the ancient Middle-Eastern custom of stamping symbolic designs on holy bread. By the seventeenth century, Western bakers used special molds to create shaped cakes for holidays. 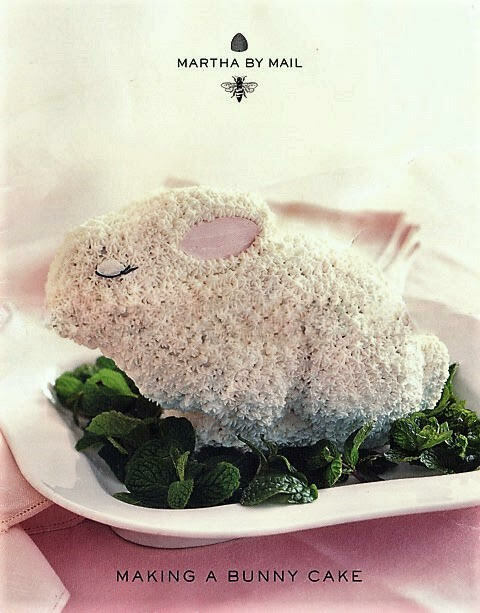 Every year, Martha decorates a lamb, bunny or chicken cake for her Easter centerpiece. This durable cast-aluminum mold will last for years. Use it with our recipes and decorating instructions to create your own annual tradition. Before using the mold, hand wash in warm soapy water and hand dry; clean the same way after using. You will need: Orange Pound Cake baked in bunny mold; a cake round (available at baking-supply stores) or piece of clean cardboard; Swiss-Meringue Buttercream; red and black gel-paste food coloring; one 12" and two 8" pastry bags with couplers; #47 ribbon; #2 round, and #18 star tip; two 11x16" pieces of waxed paper; mint leaves; a pastry brush; an offset spatula; and a serrated knife. 1. With a serrated knife, trim the bottom of the chilled cake, so it stands upright. Using a small amount of icing, adhere the cake to the cardboard base of the same size. 2. Place 1/4 cup icing in each of two medium bowls. Using food coloring, make one bowl of icing pale pink, and the other bowl black. Fill an 8" pastry bag fitted with a #47, with pink icing. Fill a second 8" bag, fitted with a #2 tip, with black icing. Finally, fill a 12" bag, fitted with a #18 tip, with white icing. 3. Set waxed paper on a serving platter; overlap pieces by 1/2". Place cake over the intersection. Using a small offset spatula, cover cake and base with a thin layer of white icing; leave insides of ears bare. Pipe inside ears with pink icing. Chill cake until icing is firm, about 30 minutes. 4. Remove cake from the refrigerator. With white icing, pipe a 2-inch band of stars under the chin. Use a small offset spatula to smooth out the eyes and inside the ears. 5. Starting at the base, pipe a 2-inch band of white icing around the bunny in small stars placed closely together. Outline the ears, eyes, and legs of the bunny with more small stars. Fill in the cake, following the contours to better define the shape. Outline the lashes on both eyes with black icing. Switch the tip on the pastry bag with pink icing to the #2 tip; pipe a large dot of pink icing to make the bunny's nose. 6. Chill cake until icing is firm, about 1 hour. Carefully remove waxed paper. Garnish platter with mint leaves, if desired. Slice the cake from the tail forward to serve. Batter may leak out during baking; place the batter-filled mold on a parchment-lined baking pan. 1. Heat oven to 350° F. Place rack in center of oven. Using a pastry brush, coat both sides of the mold with butter, making sure to cover all areas. Dust mold with flour, tap out excess and place mold in freezer until ready to fill. 2. In a medium mixing bowl, sift together the flour, baking powder and salt; set aside. In the bowl of an electric mixer fitted with the paddle attachment, cream butter on medium-low speed until lightened, 1 to 2 minutes. Gradually add the sugar and beat until the sugar has been fully incorporated and the color has lightened further, 3 to 4 minutes, scraping down the sides of the bowl twice. 3. Gradually add the eggs into the bowl, beating after each addition until batter is no longer slick, but smooth and fluffy, about 5 minutes, scraping down the sides of the bowl twice. Beat in the vanilla. 4. Reduce the speed to low and gradually add one-third of the flour mixture, followed by half of the milk; scrape down the sides of the bowl. Add another third of the flour mixture and the rest of the milk. Mix until combined, scraping down sides. Add the remaining flour, followed by the orange zest. Mix until combined. 5. Pour all batter into handled half of mold; tap it firmly on a counter to remove bubbles. Set other half on top, and place complete mold on a parchment-lined baking pan. 6. Bake 40 minutes. Remove mold from oven, and carefully invert it on baking pan. Continue baking 40 minutes more, until cake has browned nicely (run a paring knife around the edges of mold to separate, then check underneath the top) and a cake tester inserted in the cake comes out clean. Gently remove top half of mold, and set bottom half of mold with cake inside a wire rack to cool for 10 minutes. Carefully turn out cake, supporting it with your hand. Stand cake right side up, and transfer to a wire rack to cool completely. When cool, wrap cake in plastic, and chill until ready to use. You can make this icing up to four days in advance and store it in an airtight container, refrigerated, until ready to use. Before using, bring icing to room temperature and beat again until smooth and fluffy. 1. Using the whisk attachment, beat egg whites in the heat-proof bowl of an electric mixer until frothy. Place bowl over pan of simmering water (the bowl should not touch the water), and slowly add the sugar. Whisk continuously until the mixture is frothy and warm and the sugar has dissolved. Remove bowl from heat. 2. Beat mixture on high speed until stiff peaks form. Continue beating on medium speed until cooled to room temperature. Set aside. 3. In a small bowl, beat butter until creamy and fluffy. 4. Working in four additions, add butter to egg whites with the mixer on low speed, beating after each addition until smooth. Add the vanilla and mix until incorporated. Use immediately.